This Bidet with soft closing lid and seat has a heated seat with 3 temperature settings offering wonderful comfort on those chilly winter mornings. The easy to use remote controlkeypad can be mounted on the wall beside your toilet, or on either the left or right side of the Bidet seat. Press the rear cleansing button and the Bidet provides a gentle stream of warm water that will thoroughly cleanse you and in addition there is a ladies wash just for the girls. The air+ button and wide wash facilities ensure personal confidence. A simple press of the air drying button will have you bathed in a stream of warm air leaving you dry with no messy toilet paper required. There are 3 levels available for water spray mode from a direct spray to a more diffused spray. The intensive cleansing of a focused area or soft cleansing of a broader area is possible by selecting a water stream width. The unit goes to power saving mode automatically when it is not in use for 30 min. The nozzle position moves back and forth to find exact location to cleanse. Seat comfort is optimized with Ergonomic designed seat. The posterior & feminine wash nozzles are separated to enhance hygiene. MF filter for the water filtration is adapted to prevent skin irritations. Aerated water cleanses more gentle and softer and enhances cleansing control. The remote control includes LED display to indicate status of function. The mode automatically operates the ¡®Rear Cleansing¡¯ function for 1 min. and the ¡®Air Dryer¡¯ function for 2 min. 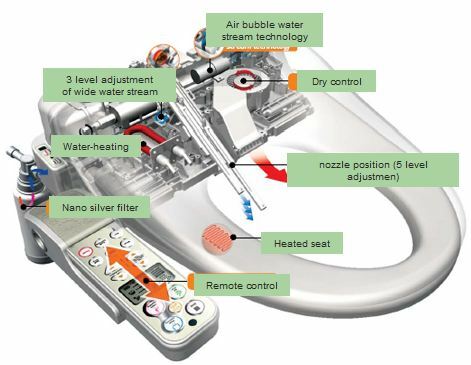 The rear cleansing/front cleansing/air dryer/auto cleansing function will not operate if the seat locking mode is on. The posterior or feminine wash nozzle automatically moves back and forth to clean broad area gently in Move mode. Temperature-adjustable dry air will guarantee clean and efreshing finish after cleaning. The water proof designed unit and control panel prevents water damage to product. The cleaning water will be automatically sprayed to nozzle for 5 seconds before and after using the posterior or feminine wash nozzle. The warm seat improves seat comfort. The button beeps can be turned off if it is necessary. The nozzle will be extended to the maximum length for nozzle cleaning. The LED on the bidet seat flashes and the alarm is turned on if the problem is detected. With the technology that combines air bubbles, this evolutionary cleansing method makes cleansing more powerful, while saving more than half of water consumption. Air pump inserts air bubbles into the cleansing water, smoothens the stream of water for bidet. The air bubbles blows off when they touch human skin, which makes it more cleaner.